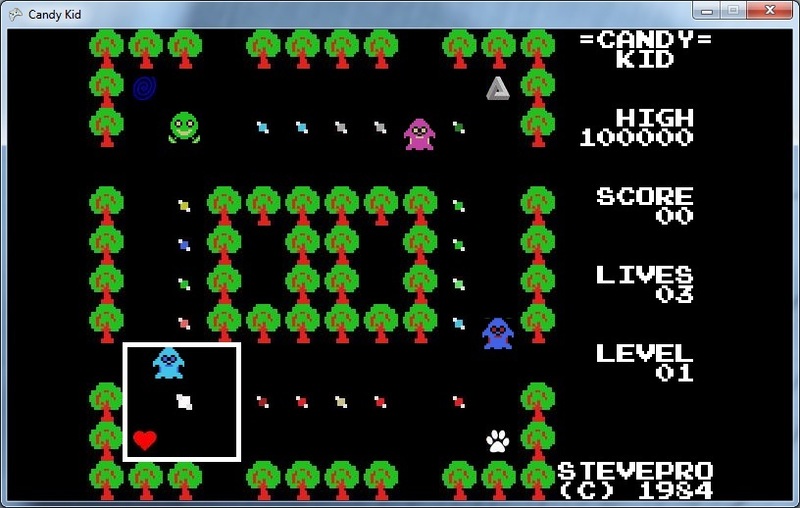 Candy Kid is a simple maze chase video game originally programmed in 1984. 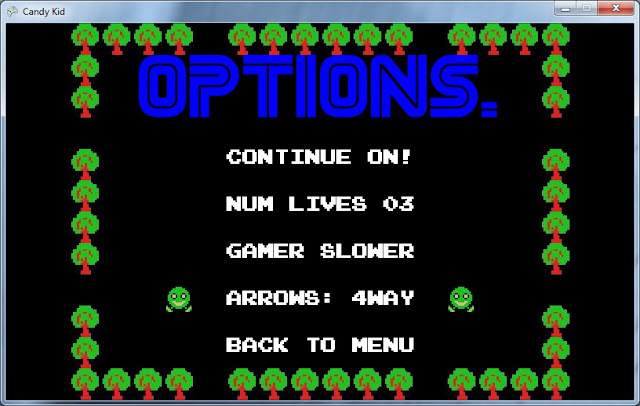 Re-written in XNA and ported to iOS / Android using MonoGame, the Pacman clone has more features that can be found here. 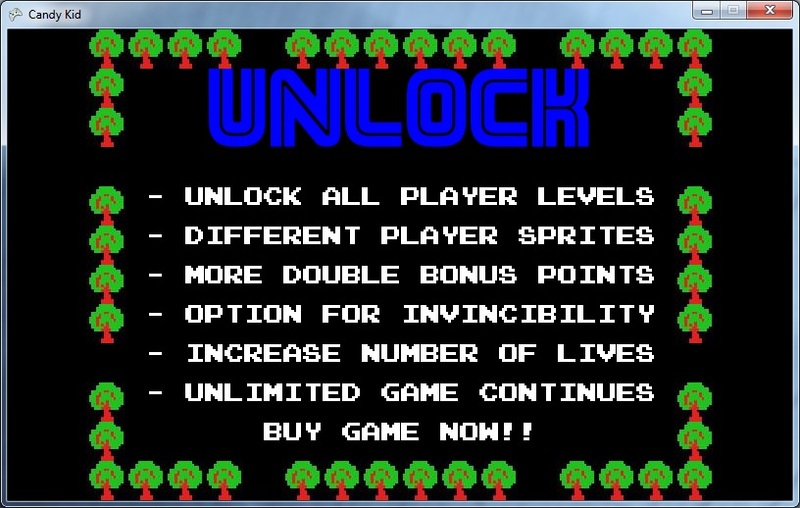 In the old days of retro gaming, cartridge-based video games had very few instructions in game. 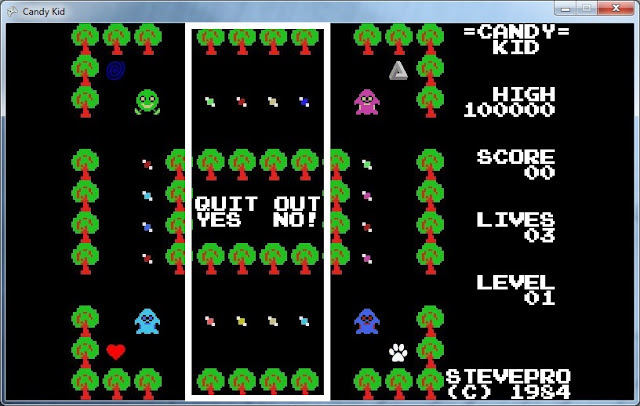 The game would be distributed with "How to Play" instruction manual. This post attempts to replicate that. Note: eat all candy + all bonus rewards extra 5,000 pts. Every fifth perfect level rewards 10,000pts. 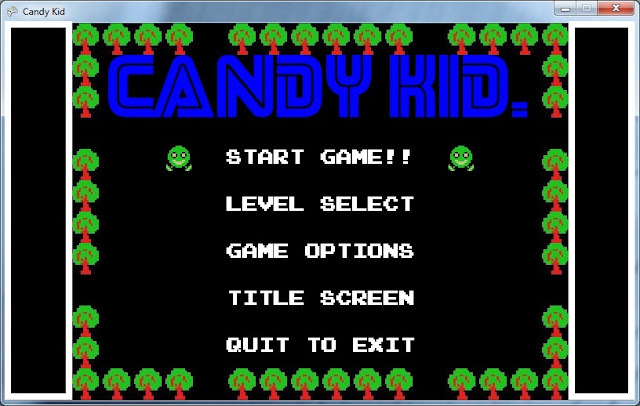 "Kid" Candy Kid. 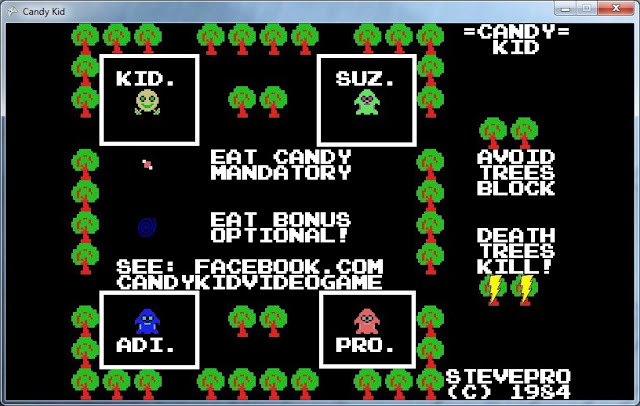 You must eat all the candy to pass each level. "Pro" Candy Mama #1. Super aggressive. High attack range. Favorite direction: Horizontal (will go side-to-side first). "Adi" Candy Mama #2. Aggressive / passive. Medium attack. Favorite direction: Vertical (will go up-and-down first). "Suz" Candy Mama #3. Super passive. Low attack range. Favorite direction: Random (will go anywhere first). Note: if Candy Mama can manoeuvre either horizontal or vertical then choose favorite direction first. During any non-game screen, tap current screen to progress to next screen; e.g. 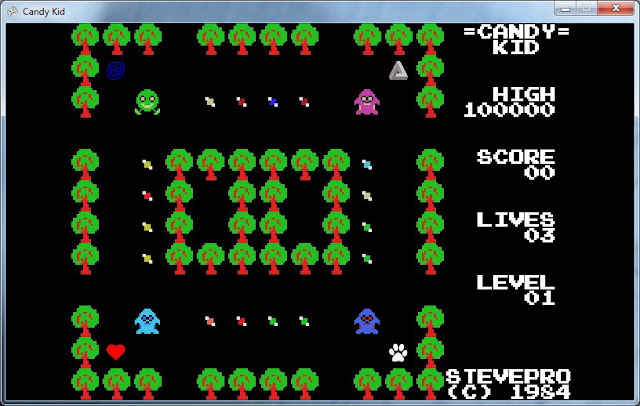 tap Title Screen to navigate to Main Menu screen. Also, hit back button to navigate back to previous screen at any time. Most options in Candy Kid are self-explanatory, e.g. Music On / Off, Sound On / Off, Continues On / Off. Listed below are some interesting options. 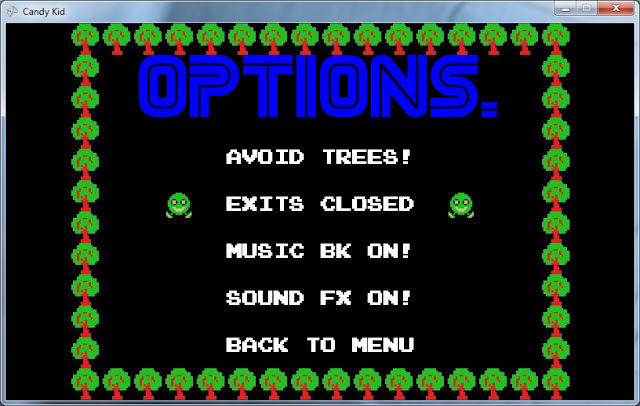 Tap "Game Options" from Main Menu to get to Options menu. Gamer can have 4x speeds: Slower, Medium, Faster, Insane. Gamer fast and enemy slow or vice versa! Tap "Enemy Attack" to alternate "Attack" when the Candy Mamas kill you and "Docile" when they don't. 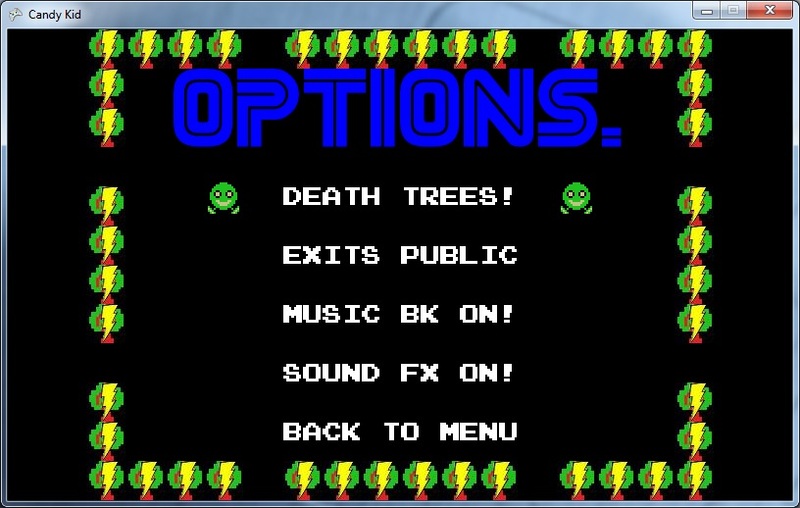 Tap "Enemy Resets" to alternate enemy "Resets" back to base when Kid dies and "Cont's" to continue. Enemy can have 4x speeds: Slower, Medium, Faster, Insane. Enemy fast and gamer slow or vice versa! 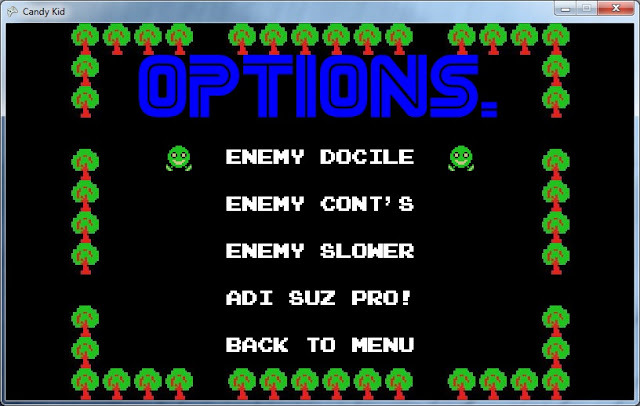 Finally, cycle through "Adi", "Suz", "Pro" to enable Candy Mama to chase; "No" means they're disabled. 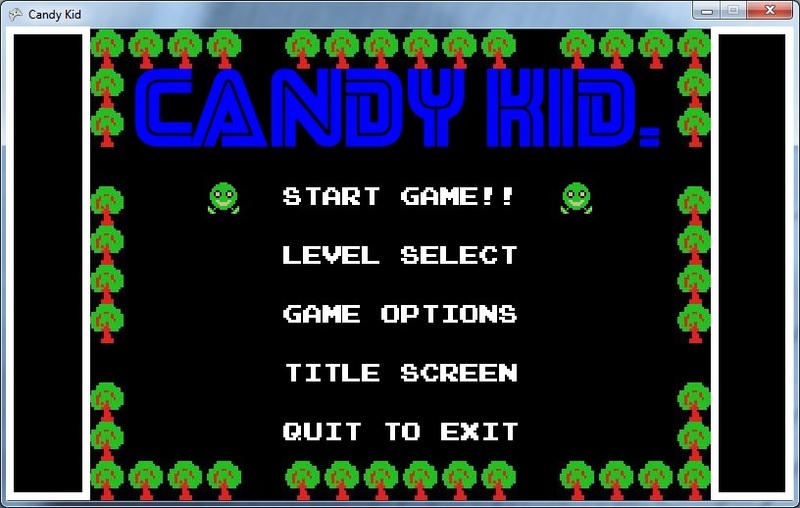 Candy Kid is a tile-based game thus once direction is chosen then it is not possible to change mid-tile. Therefore, when confronted by Candy Mama, wait 'til they choose their move direction and then move. Watch out for "Suz": she is super passive and usually evades Kid; you may collide with her more often. Make good use of tunnels when enabled, especially for faster speeds. 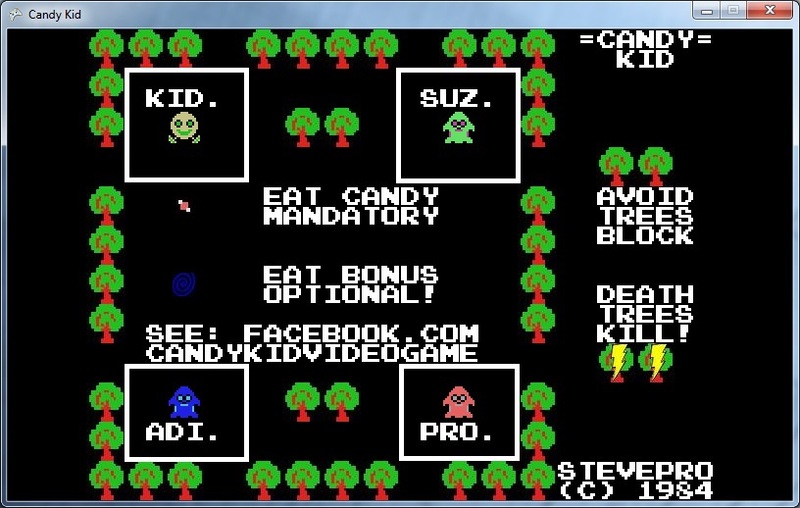 Eat candy in the dead-ends last! During game play, tap on "giant" white candy to get free man! See below, white candy is in rectangle: Note: "giant" white candy will only ever be found at Candy Kid or Candy Mama starting position (base). Important: every fifth level there is 50-50 chance of "giant" white candy so be on lookout these levels! Free man Disabled. Normally you get free man every 20,000 pts. 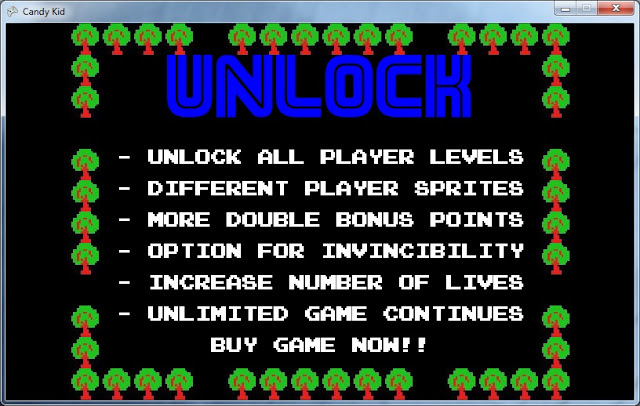 Level Select Only small percentage of all levels are unlocked to play. Instructions Disabled. Not possible to select alternate color sprites. Gamer Option Unlimited continues disabled. Game over immediately. Gamer Option Num. lives feature is disabled. Only ever have 3x lives. Enemy Option Candy Mamas always attack! Kid invincibility disabled. Enemy Option "Adi", "Suz", "Pro" always enabled and chase all times. Secrets Disabled. There is no "giant" white candy for free man.